The OM Shoppe: How to Reap the Benefits of Pure Himalayan Salt Air without Even Leaving Your House! How to Reap the Benefits of Pure Himalayan Salt Air without Even Leaving Your House! Go into a salt mine and you may quickly find you’re breathing much easier. And that easy breathing is not just because you’re away from the hurly-burly chaos outside the mine, but because you’re inside a veritable cavern of healing. 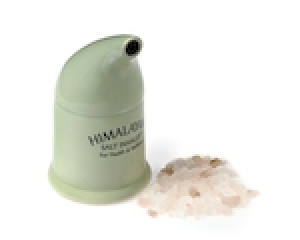 It is a widely known fact that salt crystals help relieve symptoms from a wide variety of respiratory symptoms and a Himalayan Crystal Salt Inhaler is frequently recommended by doctors. Salt mines have long doubled as nature’s own treatment centers, acting as a natural body detox while alleviating a host of respiratory issues. The massive Wieliczka salt mine in Poland is even outfitted with a special sanatorium where visitors flock to alleviate asthma, bronchitis, allergies and other ailments. And then there’s the Himalayan salt mines, which are even more widely revered than Poland’s mine for its pure and propitious Himalayan salt. The pink crystals are packed with 84 minerals, offering a smorgasbord of benefits for anyone who breathes in the air. Heading over to Pakistan to visit a Himalayan salt mine for yourself. Building your own Himalayan salt cave like a guy featured in the Vancouver Sun. The man imported 15 tons of the salt into Canada and created a cavern lined with the salt, which is open for visitors in a North Vancouver strip mall. Checking out a Himalayan crystal salt inhaler. Salt inhalers are fairly simple devices, consisting of a small chamber with a small cone-shaped nozzle on top. You put Himalayan salt crystals in the chamber, secure the top and inhale through the nozzle with your mouth, exhaling out of your nose. What happens next is up to you, but you may want to sit down for a few minutes and enjoy the cool sensation that follows. Dr. Oz likened the sensation to a head rush when he featured the Himalayan salt inhaler on The Dr. Oz Show as one of the top alternative health secrets in the U.S. In addition to the aforementioned initial head rush, breathing in the pure Himalayan salt air serves up a host of additional benefits. Himalayan salt is one of the most widely recognized natural detox products, removing poisons and impurities by drawing them out of your body. A Himalayan salt pipe also draws moisture out of your throat, reducing swelling and inflammation associated with throat ailments. The dozens of minerals and trace elements in the salt result in the replenishing of your body’s own natural mineral content, inclusive of the all-important potassium. Himalayan salt contains no additives, caking agents or impurities, leaving you with all-natural relief from the daily damages of air pollution, smog, dust, fog and secondhand smoke. Please note: These statements have not been evaluated by the Food and Drug Administration. None of our products is intended to diagnose, treat, cure, or prevent any disease. Information and statements made are for education purposes and are not intended to replace the advice of your treating doctor. The OM Shoppe does not dispense medical advice, prescribe, or diagnose illness. The views and nutritional information expressed by The OM Shoppe are not intended to be a substitute for conventional medical service. If you have a severe medical condition, see your physician of choice.